For many years, Puglia’s Movimento Turismo di Vino has run a series of events in August to showcase not only the wine and wine producers of the region but the cultural and artistic resources that Puglia has in abundance. The evocatively named Calici di Stelle (Goblets of Stars) is timed to coincide with the spectacular Perseids meteor shower which fills the night sky with shooting stars in the first two weeks of August. The second night of this, Puglia’s only open-air wine tasting event to promote wine-tasting outside the wineries, is on August 10th in the ancient little town of Copertino in Salento. Visitors are taken on a wine trail through the winding streets of the town and in between star gazing and enjoying the entertainment can try a glass or two of Puglia’s most delicious wine from the many participating wine producers lining the streets. 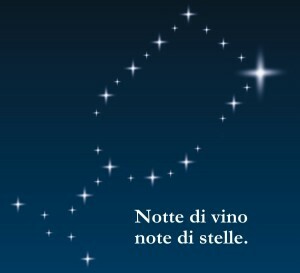 A must-see event for anyone interested in wine, stars, local culture or a combination of all three. Price: 10 euros for a “tasting kit” including a wine glass and a voucher for eight tastings, some taralli ( a kind of Pugliese pretzel) and a guide to the walk.